Although the prologue of the book was written in third person, the rest was written in first person and the POV of only one character, which is always much easier to read. I liked Ben as a character and I also liked the relationships he formed with the other characters. It was interesting to see people who would probably have never talked in normal reality have to pull together to save themselves and each other. I did feel that the military/navy wasn’t painted in a very good light. Even the ones who weren’t ‘bad’ seemed to lack a certain kind of intelligence. Amusingly enough, I had Captain America flashbacks with the character of Bucky. (I actually did like him). 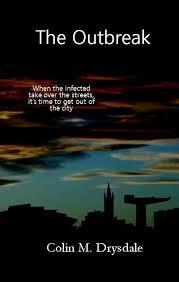 I felt the spread of the infection came across as quite realistic. In the world we now live in, travel is so easy, that it made sense many places would be overrun by the infection before modes of travel could be cut off. It was also interesting to see a doctor in one of the characters. I felt that a lot of research had clearly gone into this book, as well as the author drawing on his own personal experience. I felt that the characters were interesting and well-rounded and I actually cared about them. Also, despite the near misses, I felt the danger they were in was very real. There were times when I really felt for the characters, particularly during those moments when they had to make the tough decisions. I was able to empathise with them easily and I found myself avidly reading the book to find out what would happen next. I’d probably read the other books in this series at some point.